A tiny quilt finish this week! 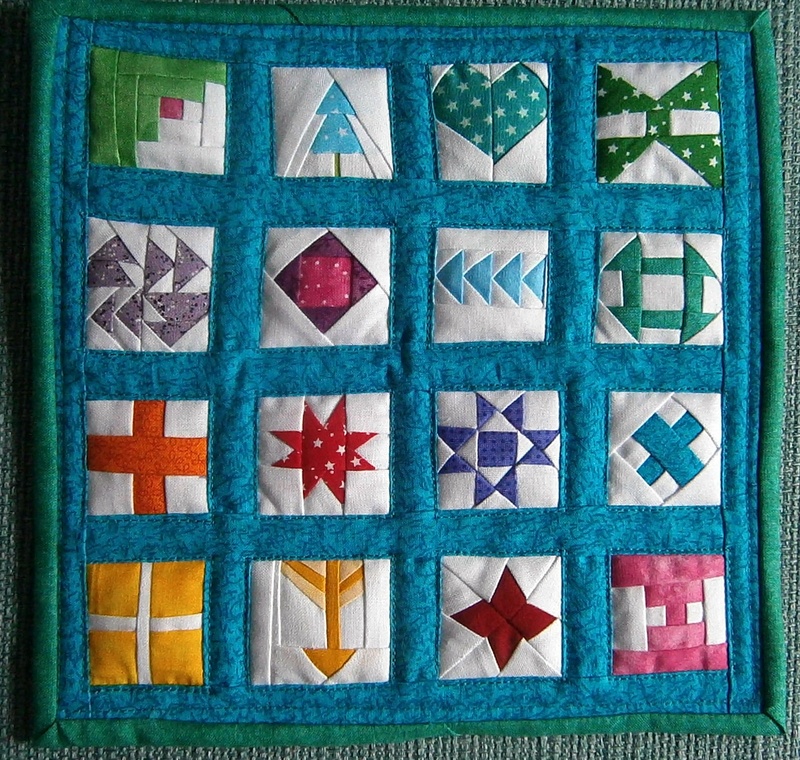 At just 8" square, this makes me smile every time that I see it (which is frequently, as I've hung it just above my PC!). 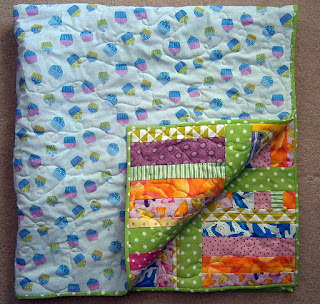 The blocks were fun to make. 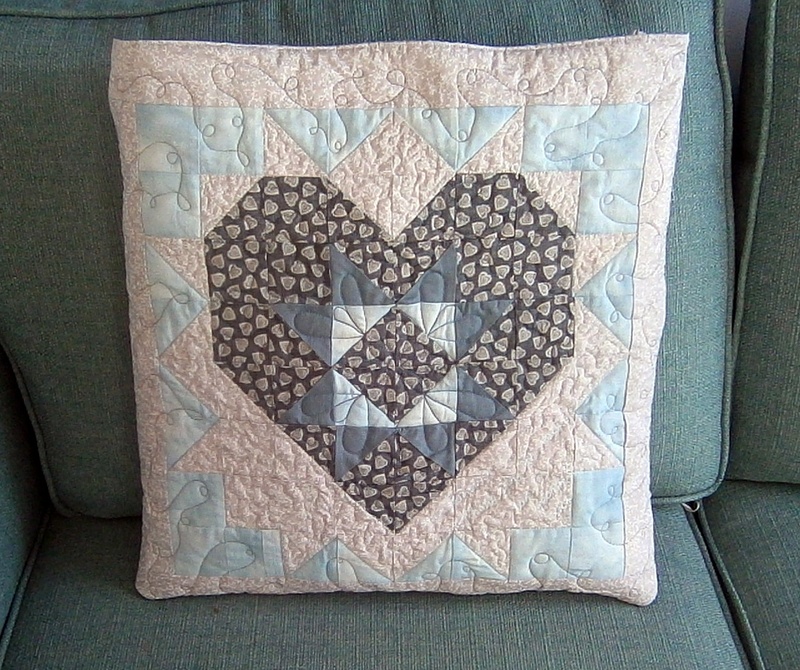 Yes, I've made plenty of mistakes, but they are all my own work, not the fault of the pattern at all! This is my version of the Sew Tiny Sampler by Kitty Wilkin which was released last month. 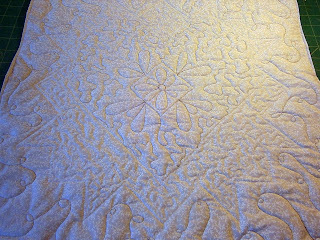 The blocks had so much going on in them already that I didn't want to overwhelm them with quilting, so I just echo quilted in the sashing. It would have been more accurate if my sewing machine light was working (do I need to confess that a call to my sewing machine repair guy managed a down-the-phone-line fix when he asked "Have you tried the light switch on the back of the machine? "......who knew? I've only had the machine (ahem) about ten years!). 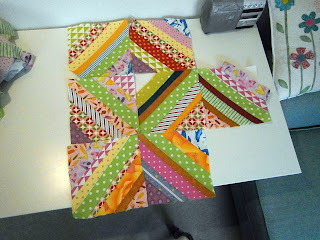 Still, a good fun finish, with plenty of room for self improvement if (when!) I give it another go! Another quilt born of the scraps from the charity quilt making evening! 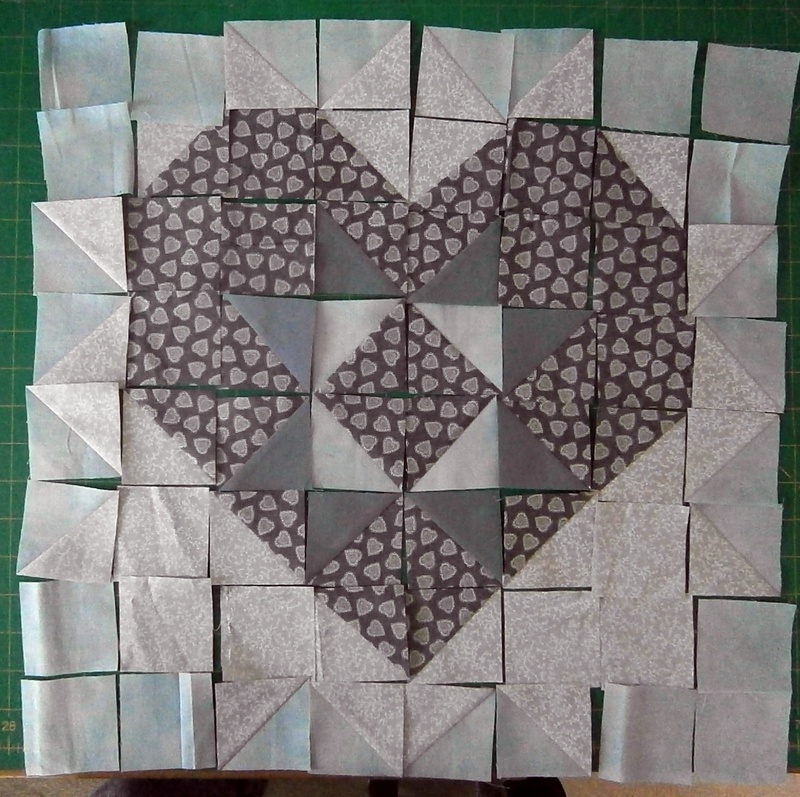 I started putting some of the scrap colours that went together well - a mix of greens, browns and pinks - into blocks. Then I remembered that I had a panel in the same sort of colours that could be used. 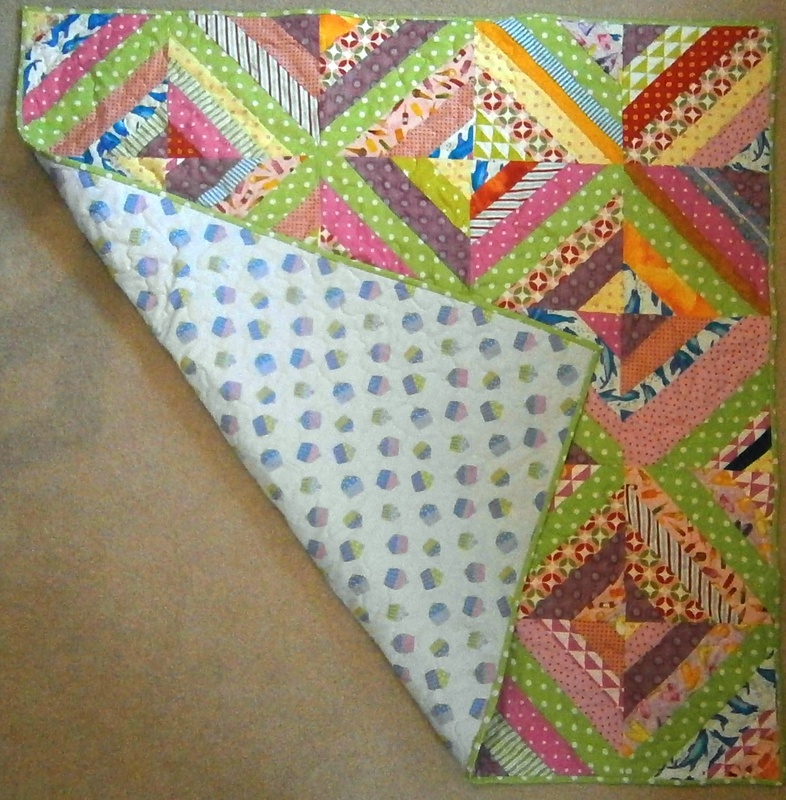 The layout wasn't absolutely ideal, but I was in a make do and mend mood, so I made them fit! 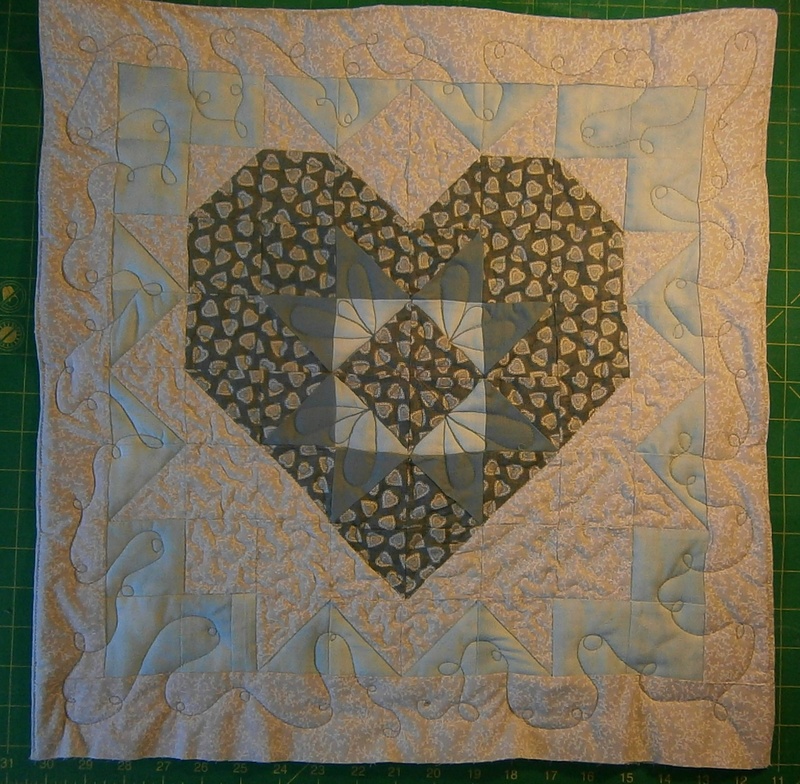 The backing was a challenge too! 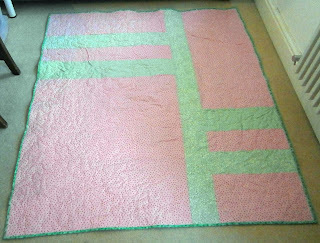 At 48" x 54" it was too wide for a normal width of fabric, but as I didn't have anything in the right sort of colours, I had to put together this backing. 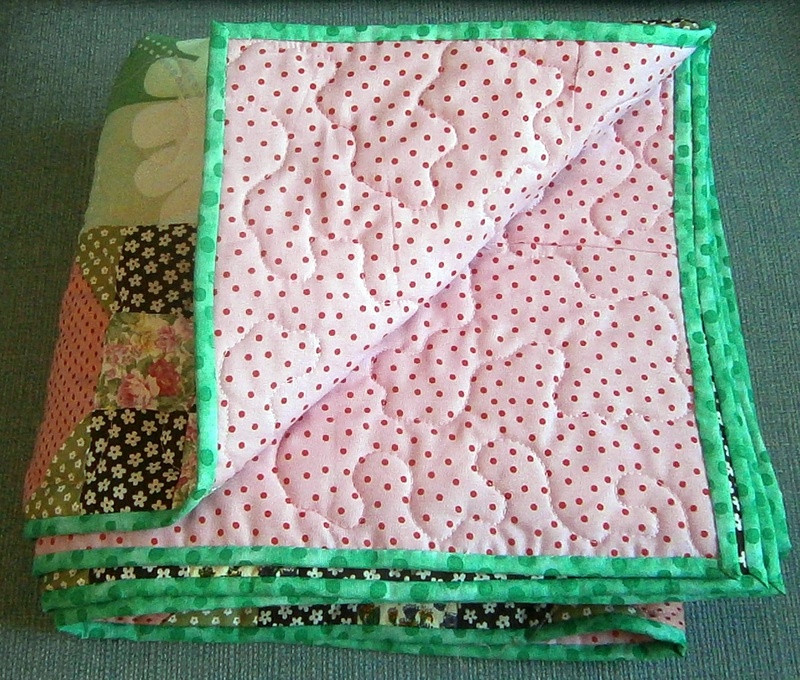 It uses two different types of green fabric and a long narrow remnant of pink. It was a bit touch and go, but I had just enough to make it work. 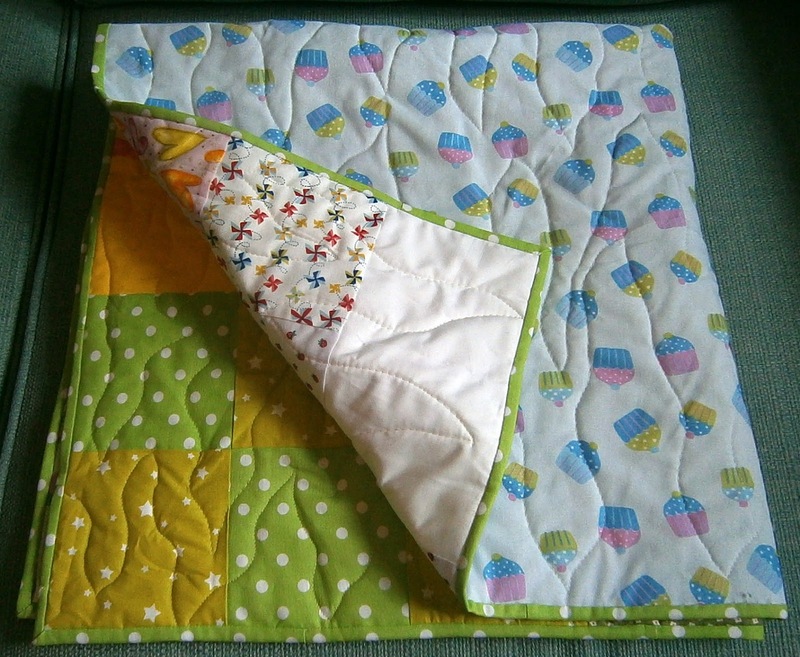 Of course, I hadn't thought about the binding, and I didn't have enough of anything to work properly, so I used another green (which I thought was closer to some of the greens in the central panel than it actually was - oops!). 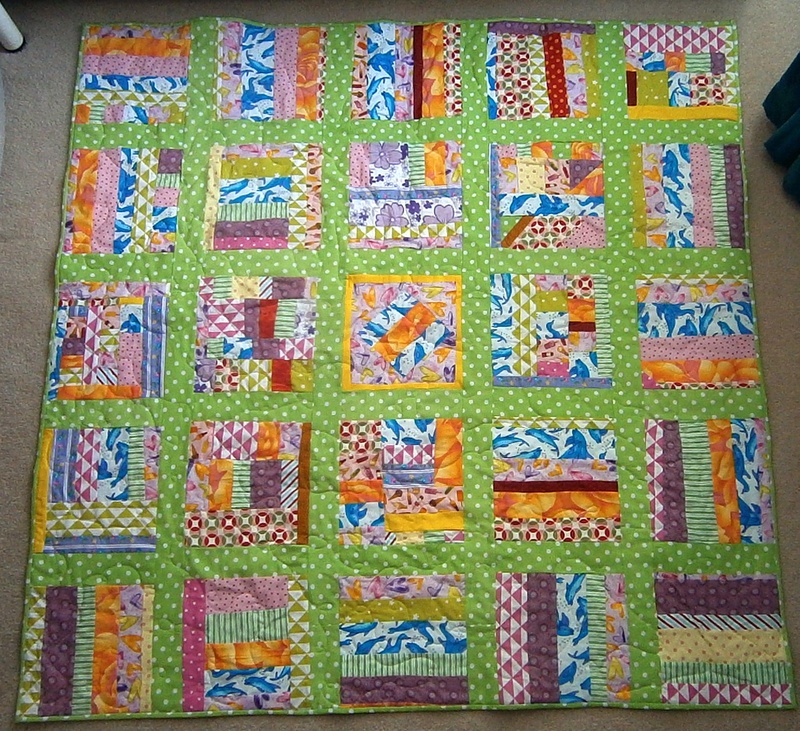 Still, as a 'make do' quilt with hardly any stash shopping at all, let alone actual shopping, it's turned out well! 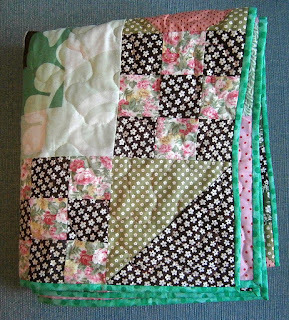 Thanks to the generous donations of the RKQ quilters! 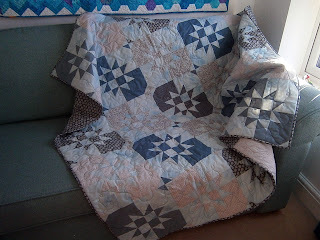 Another donation quilt complete. 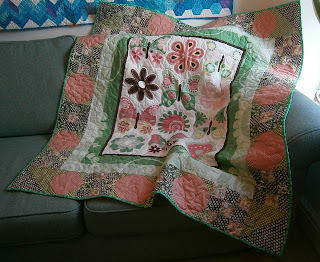 My 10th quilt finish of the year, along with a set of fabric post cards, a couple of fabric buckets, a skirt and some other odd hemming and repairs along the way. No wonder that my machine is asking for a service! Sewing will have to slow down a little whilst it is away for a few days. 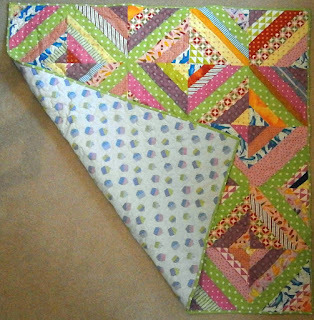 Remember that I had some left over strips from the last 'lattice' quilt? 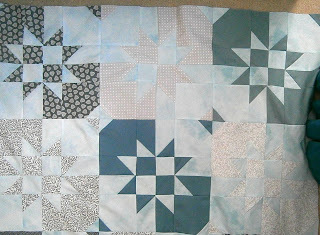 Not very much fabric needed to be added in order to make this 'not quite a crumb quilt' quilt. 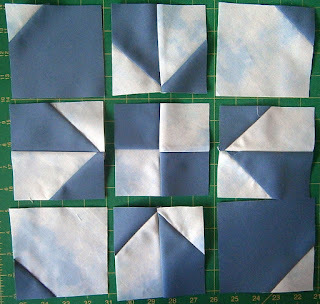 Some blocks are made with strips going in just one direction, others have several 'strip sets' added in order to make the required number of squares. 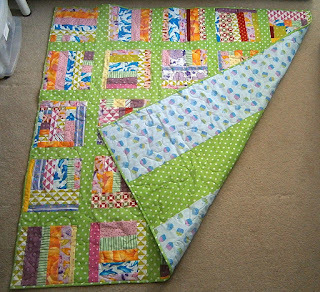 Obviously I added the bright green spotty fabric again, for sashing, binding and a strip inserted in the backing fabric to make the required width. 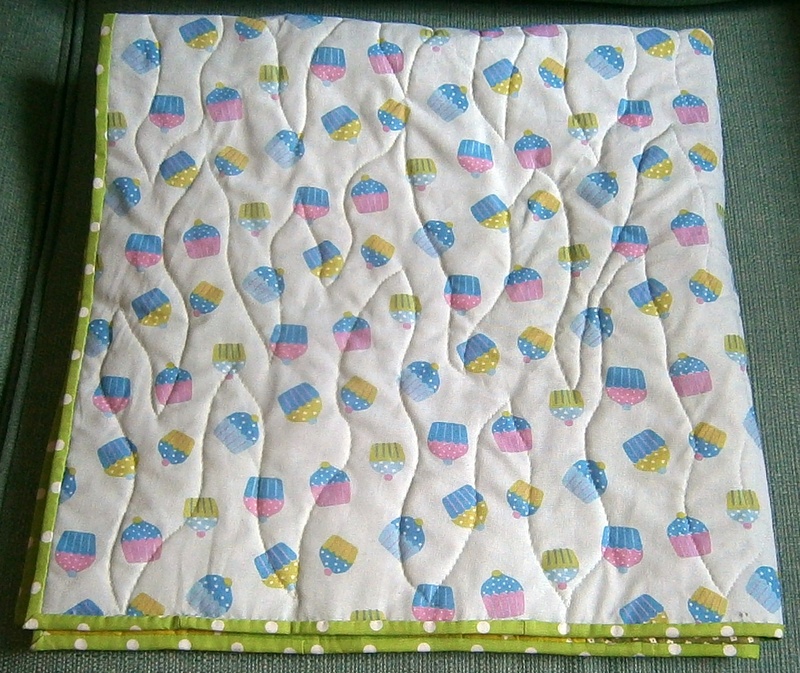 It was sandwiched with 'reclaimed' wadding - all those little bits that are left behind from other quilt trimmings. 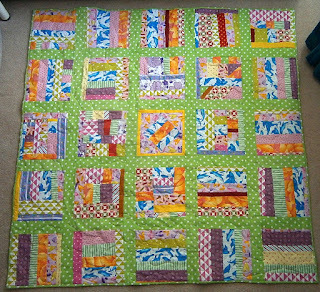 About 30 pieces of batting were joined to get to the 48" square required. 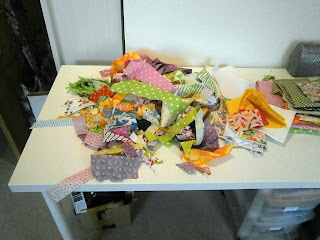 Now on to the next pile of scraps from our charity evening! 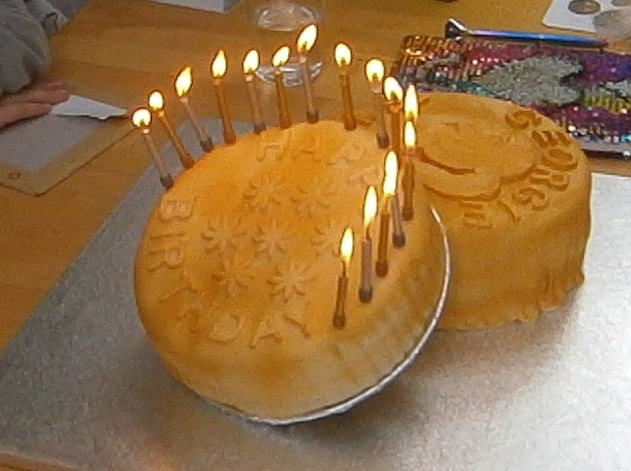 Amongst the sewing time, there was also time for plenty of cake and fun as my DD1 celebrated her birthday. My attempt at coins, as most of her presents were related to her newly burgeoning coin collection. The disorder of last week has resolved into this completed quilt. Backed with some cheerful cupcake fabric that also contains that bright green. The whole quilt is bright and fun. I love how it turned out! 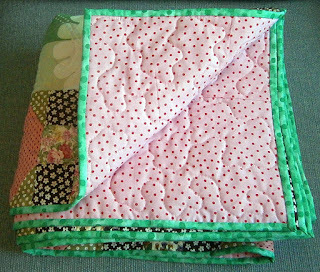 Perfect to complete on the spring equinox! 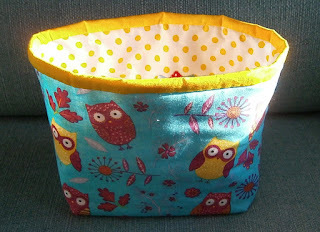 Another fabric bucket complete with mini Dresden means another gift completed for later in the year. 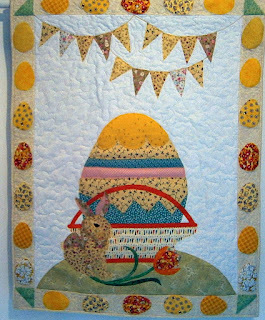 My second Easter wall hanging also started and finished this week. 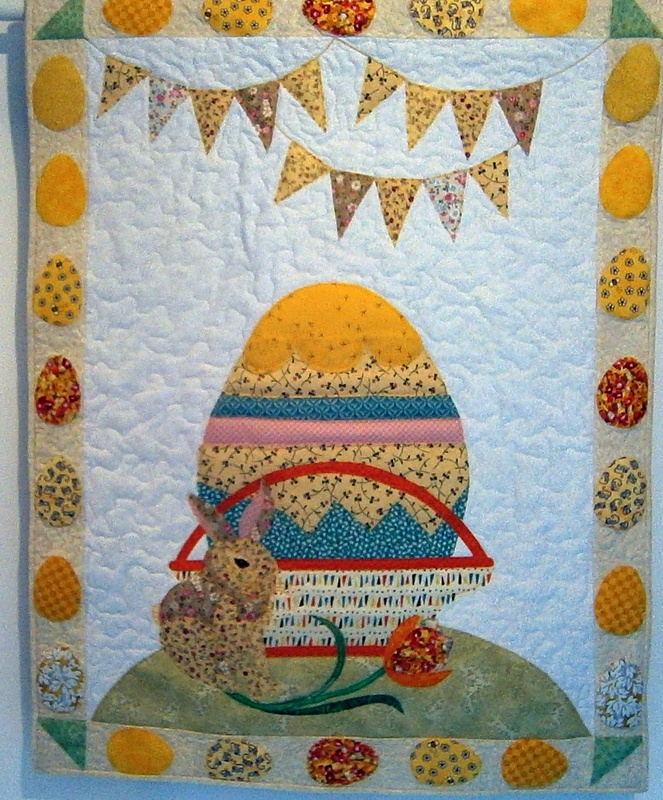 The pattern is by Ester Aliu, called Easter Blessings. I've made it with fusible applique. Plenty of yellows as that's a favourite colour of my SiL (as well as being a great spring colour!). Actually, although I said that it was finished, as I'm looking at it, I realise that I'm not quite happy with it. 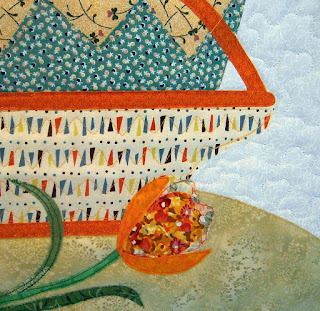 The basket fabric looks beautifully different up close like in this shot, but doesn't really have the definition that the bands and handle suggest that it should have. 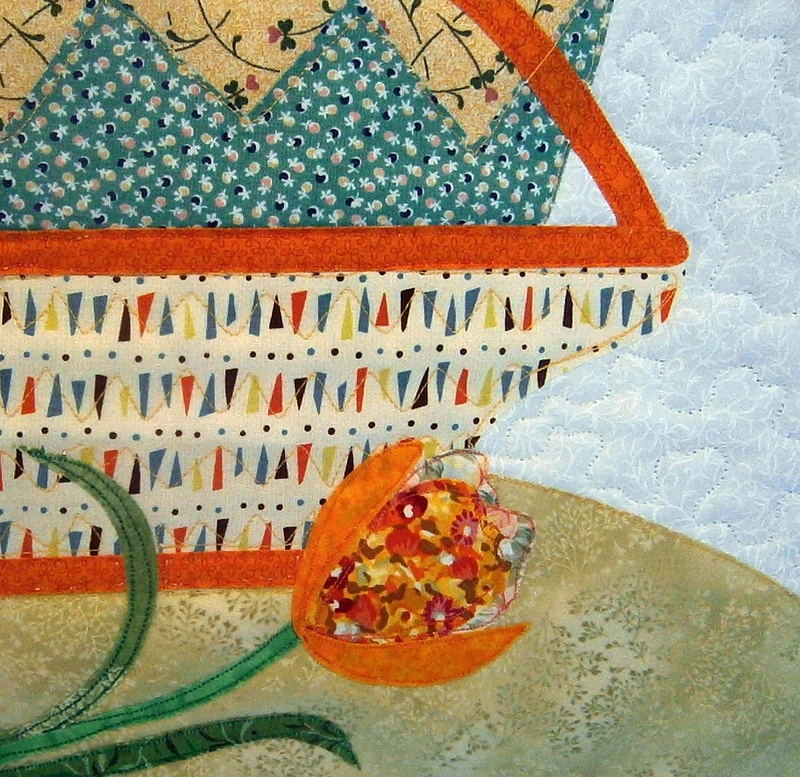 I can either try and address it with Inktense pencils over the whole basket, or perhaps try to define the edge more with some orange thread quilting. Sometimes you need to step back in order to see more clearly, don't you? We had a fun quilt meeting on Monday, where Benta set us off on a string quilt evening, working in small teams to make blocks for charity quilts. Although I took some fabric, I seem to have come home with extra, and most of my original fabrics in strings - see the disordered pile above! These were the blocks that our team made. 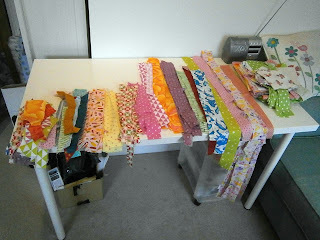 I sorted the strings and will make more blocks in order to complete the quilt. 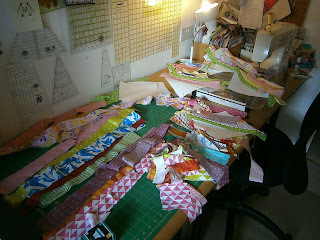 Fun times with fun fabrics! Of course, despite starting with order, my sewing space quickly descended into disorder. Its fun, but the process isn't neat! 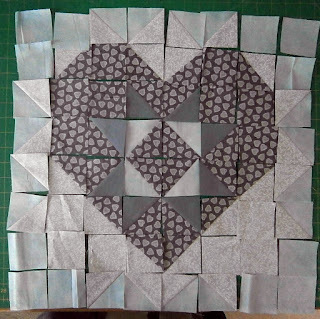 I'm looking forward to completing the 20 blocks for this quilt top, and I'm thinking that there might be more strips than I need, so more blocks can be made. Looking forward to seeing what comes out of the piles! 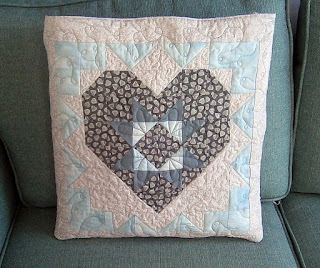 The first is a happy finish - you know the sort, when you finish a quilt and it says what you want it to and your work isn't too bad either? Great, isn't it? 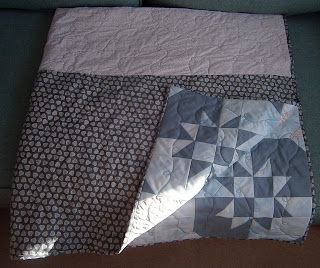 This is the quillow front - before I attached it to the quilt, but after I'd quilted it. 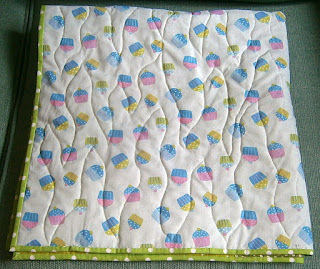 I used a mixture of quilting techniques (and thread colours) on it. 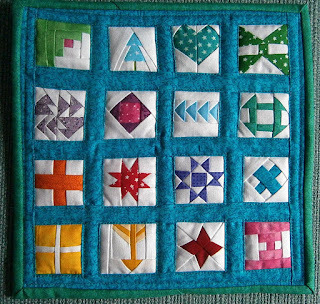 Patterns based on the piecing in the centre, some FMQ stipple, some stitch in the ditch (very unusual for me, but this really needed it) and some loop the loop to complete it. 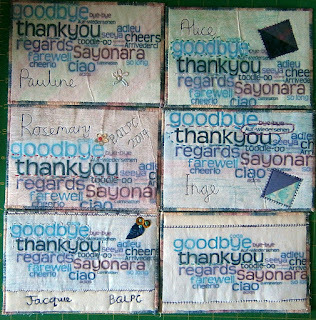 There is also a personal message 'hidden' - which is always fun to do! 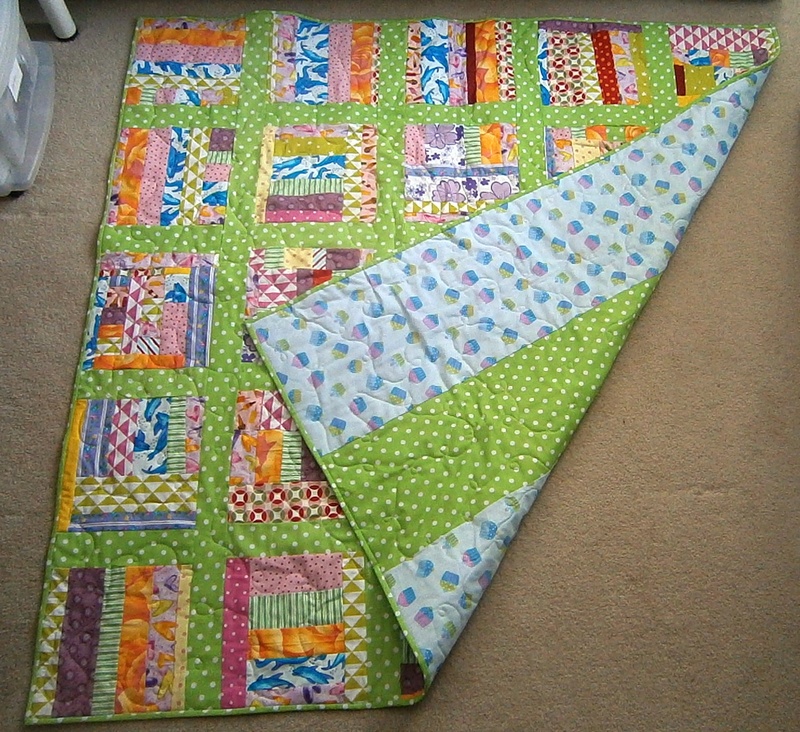 The back - it was three almost equal stripes in order to get the 57" width that I needed. Final picture, with the quilt neatly folded into itself - aren't quillows great? I'm hoping that when this is gifted it is welcomed for what it is. The second type of finish is much sadder - the finish of a fabric postcard swap that I've been part of for several years. We don't really have enough active members to carry it on in the same form, so these are (most of) the cards for our 'Farewell fling'. This lovely one is from Alice - suitable fabric and additions on both the front and the back. 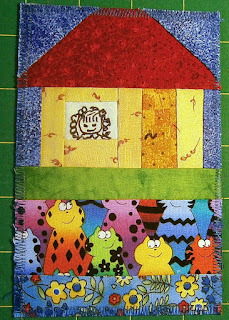 This cutie is from Inge - so clever with the face in the window and the fun 'front garden'. 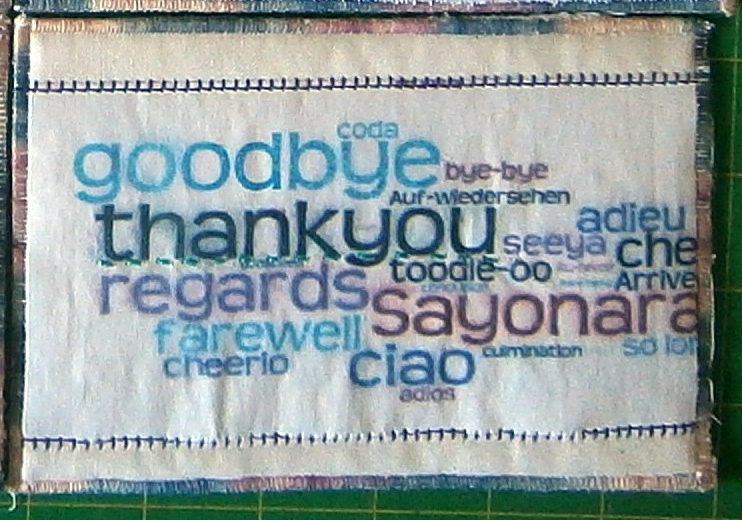 A special bonus from Jacquie - a beautifully made farewell gift, in the form of a lovely folio. Just gorgeous! 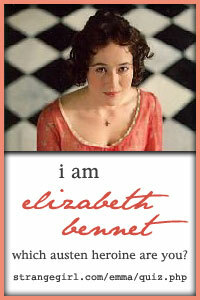 This was her farewell postcard to me. 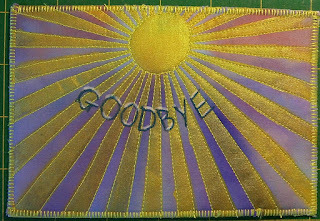 Clever use of a machine decorative stitch and variegated thread produced a super card. 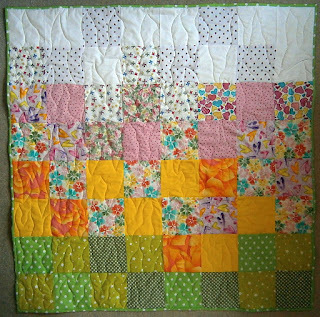 This bright number with precise machine stitching and hand highlighting is from Pauline. 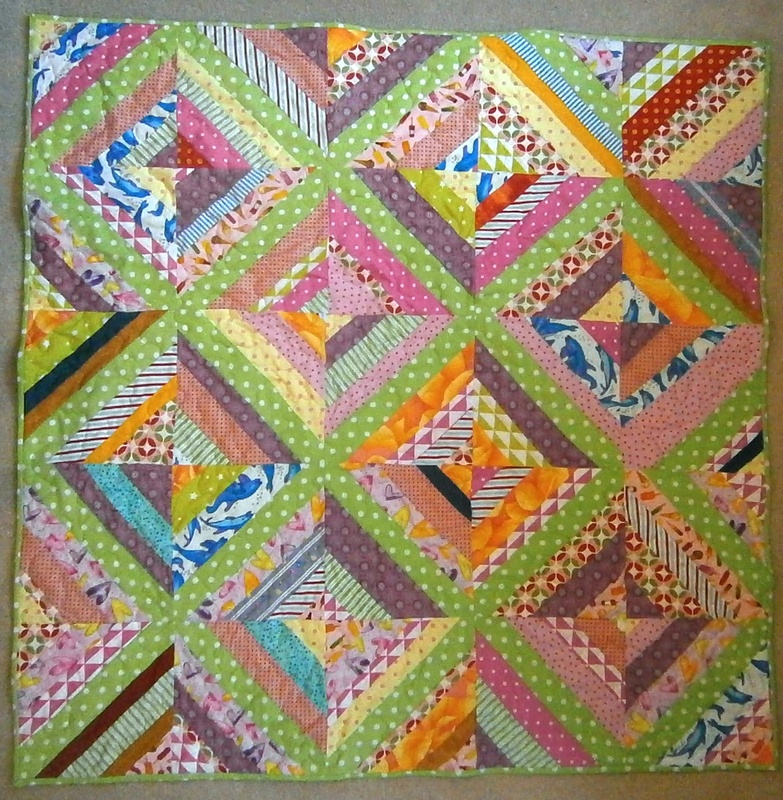 The photo doesn't do justice to the neon thread used - it is amazing! This was my offering - or at least a generic sample of the cards that I made. 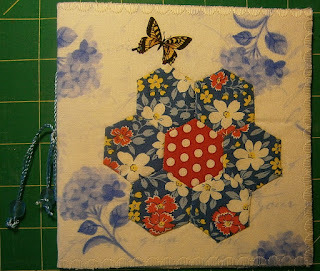 I printed paper, used dilute PVA to adhere it to a fine calico, then used it as fabric. 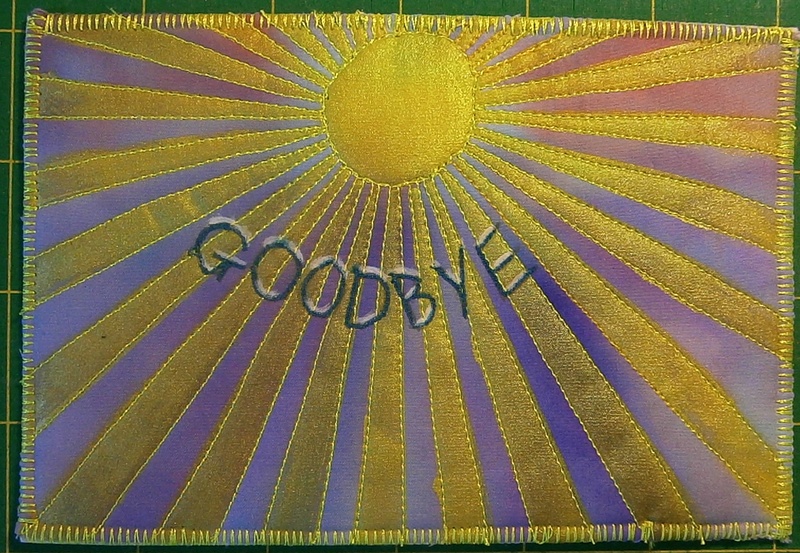 I used both machine and hand stitching as well as Inktense pencils and some additional embellishments to decorate them for each person that I sent to, then stiffened with buckram and backed with plain fabric. 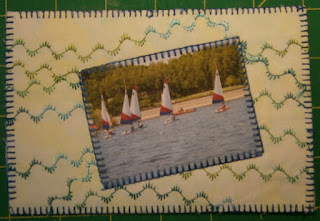 Finally, this fun card from Rosemary - love the use of sewing themed fabrics! 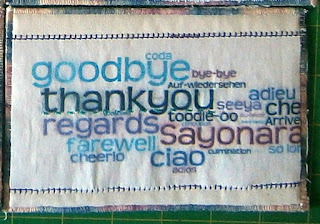 Thank you everyone for being great swappers - both in this swap and over the previous years. 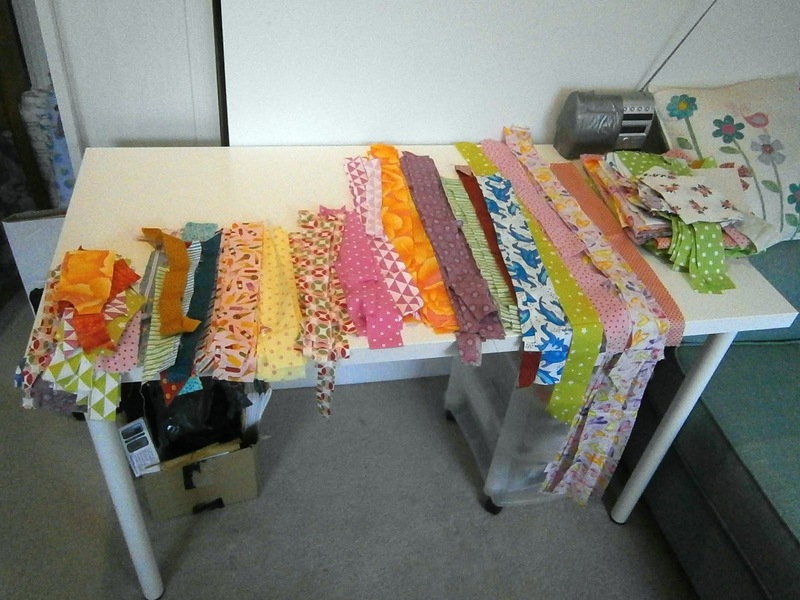 I shall miss all our fabric fun and the lovely post that we've shared. Hard to see on this photo, but the centre block at the top in this photo is WRONG! For some reason I'd failed to follow my own instructions (or anyone else's!) and the centre four patch wasn't rotated as it should be. Doh! 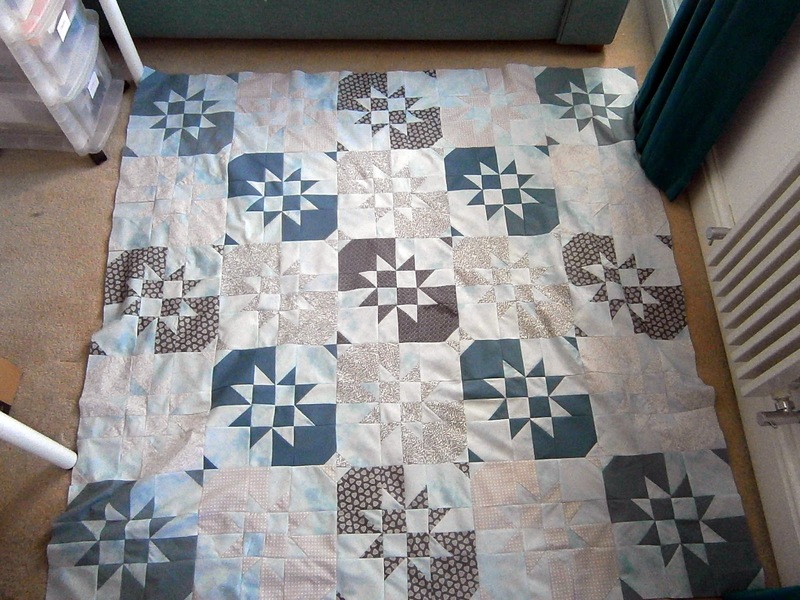 At least I found the problem at the 'ironing the quilt top' stage, just before basting, rather than after basting which would have been even more annoying! Still, I don't really like to spend my precious sewing time re-doing what I should have got right in the first place! 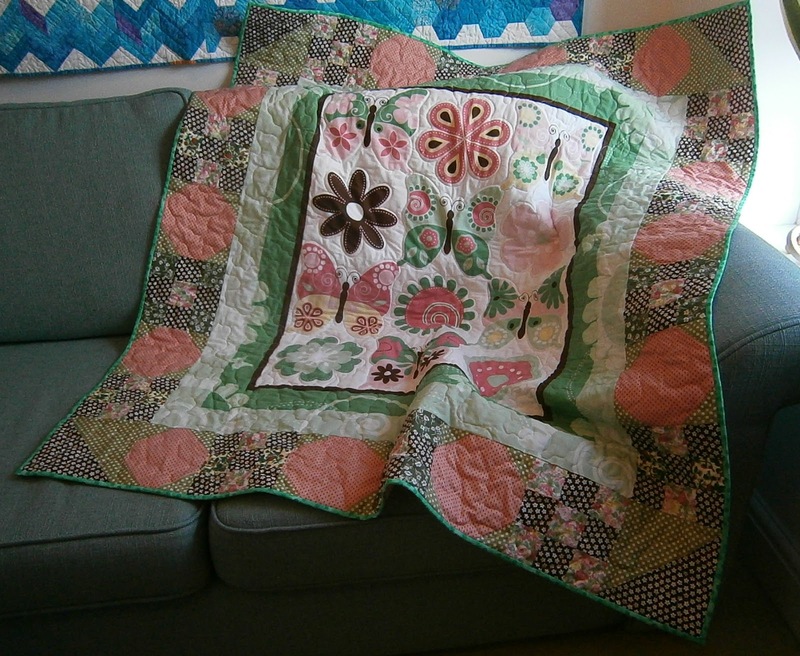 When it was corrected and the quilt basted I then sat down to quilt. 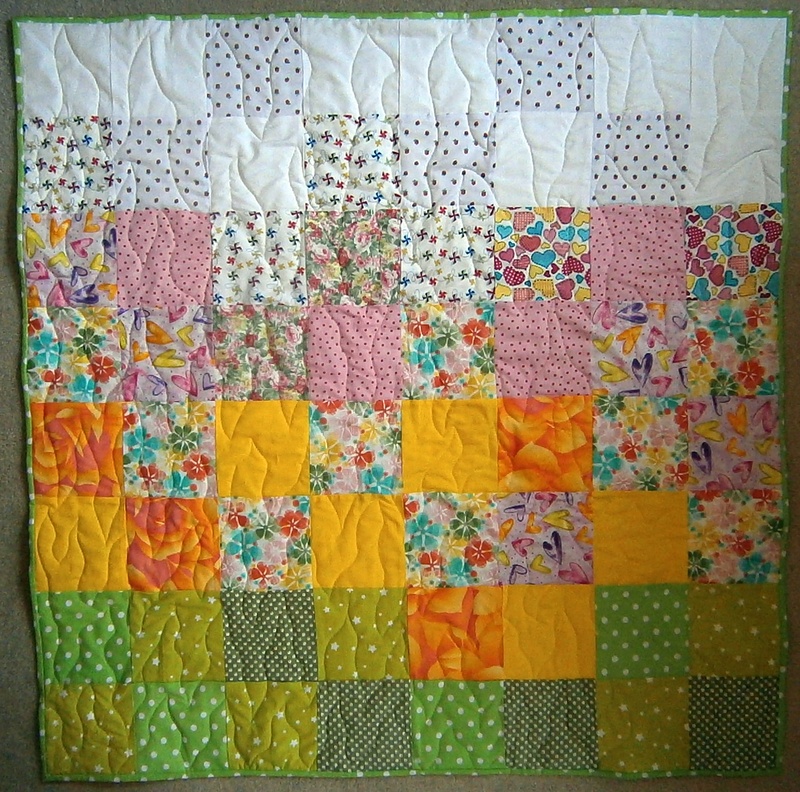 Having chosen what I thought was the perfect thread I wasn't completely convinced that I had enough to complete the quilt - which does make you a little bit tense, particularly as I have no idea what make or colour name this little lovely is! Looks like a Cotty spool, but has nothing stamped on it.... 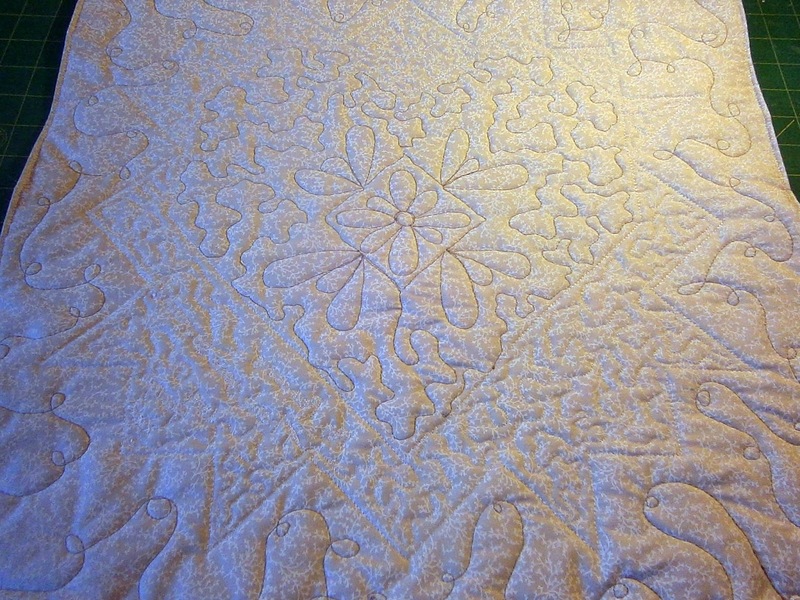 Still, success - and the quilting on the main quilt was completed. 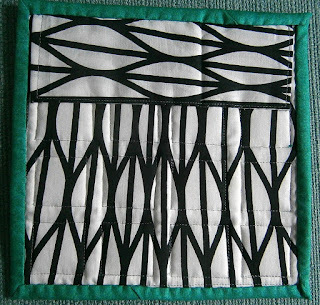 I shall also use this on the cushion front part of the quillow, but from the centre out so that any change can look as though it has been planned! 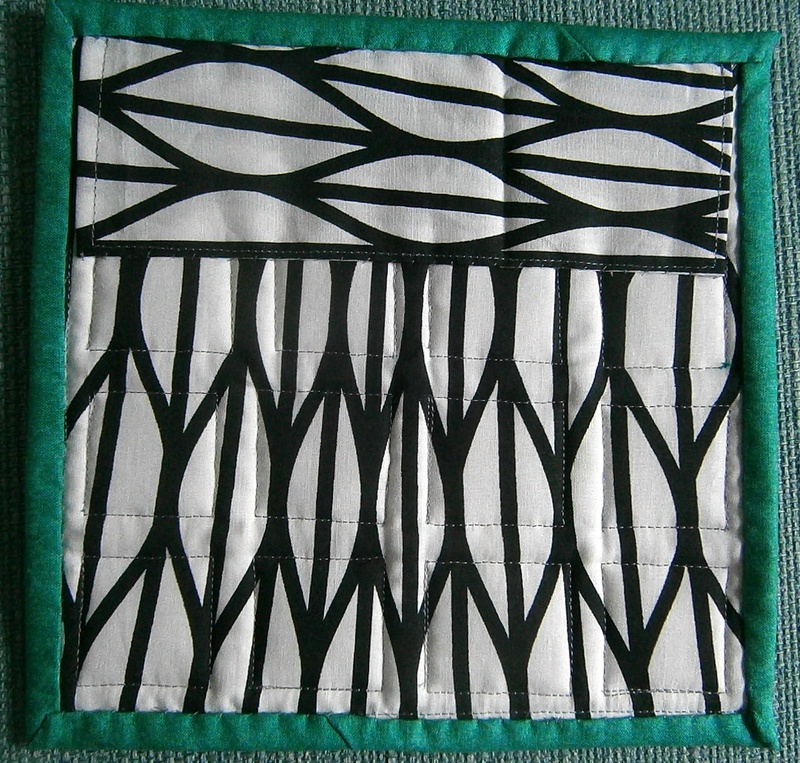 This is the layout for the cushion front - taken from the Twiddletails blog earlier in the year. I'm pressing ahead with it and trying to get it complete before my sewing space is given over to being a guest bedroom at the weekend! Fingers crossed that by then I'll be down to the hand stitching on the binding, but I still have some way to go before that yet! 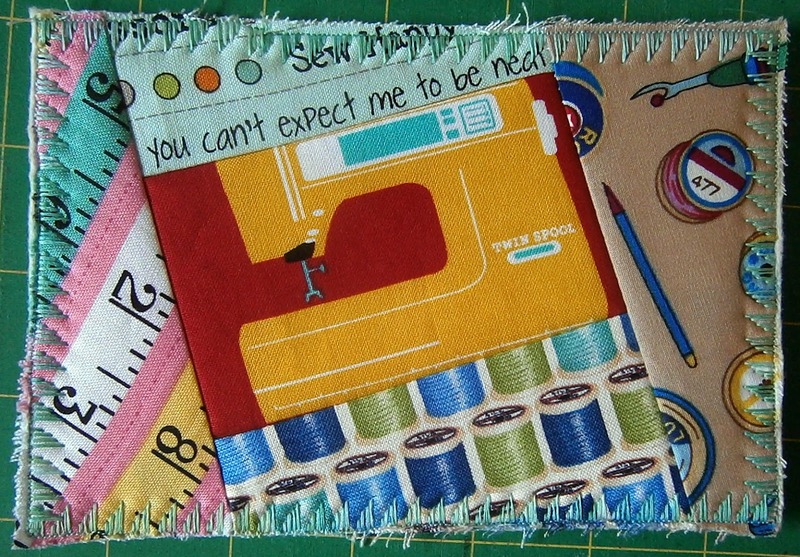 Hope that you are enjoying some sewing time too! 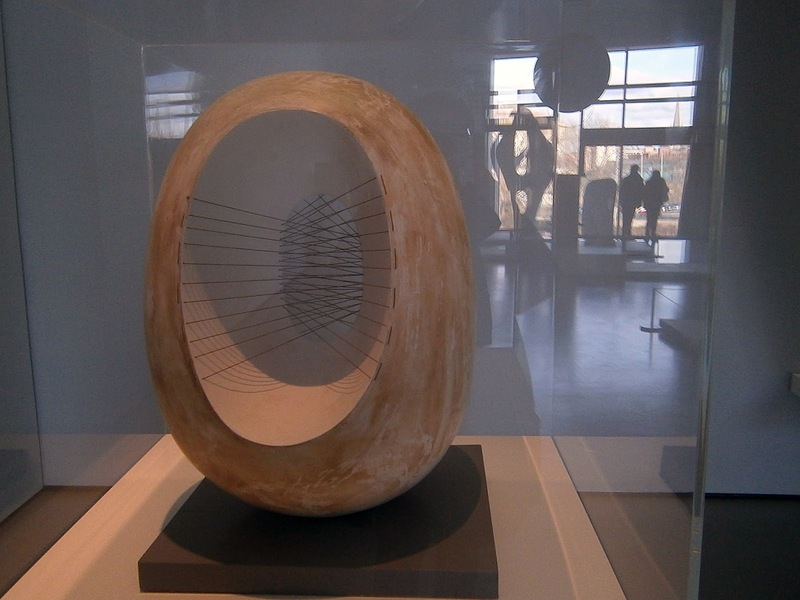 First of all, I must tell you all to try to visit The Hepworth in Wakefield. Fabulous art, fabulous building, fabulous access to lots of Barbara Hepworth's work. Hard to believe that it is free - although I'd recommend that if you can afford it you make a donation / buy a book / spend time and money at the café in order to help fund it. I was blown away by the whole museum, but the Hepworth and Moore galleries in particular. Visit if you can (and if you are in that area, the Yorkshire Sculpture Park too - lots of lovely art in the fresh air). 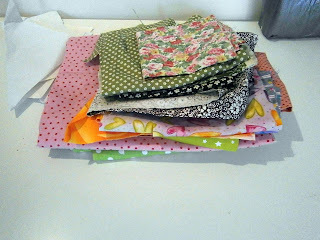 Now on to the main part of my week - starting a new quilt! Time for me to try a different disappearing hour glass pattern. 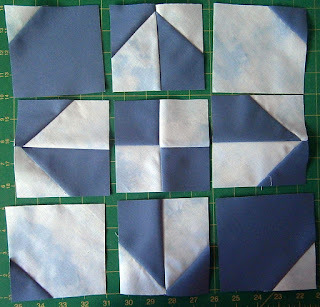 Start with an hour glass block and cut into thirds in each direction. 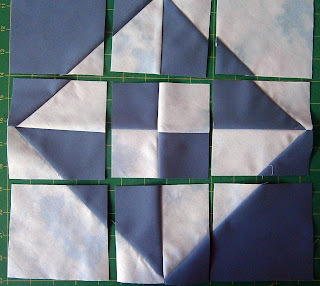 (once more I started with two 10" squares, sewn right sides together around all four edges, cut on both diagonals, opened out and resewn into the hour glass, which gives me a 12 3/4" block to start from. Now rotate the centre block 90 degrees. 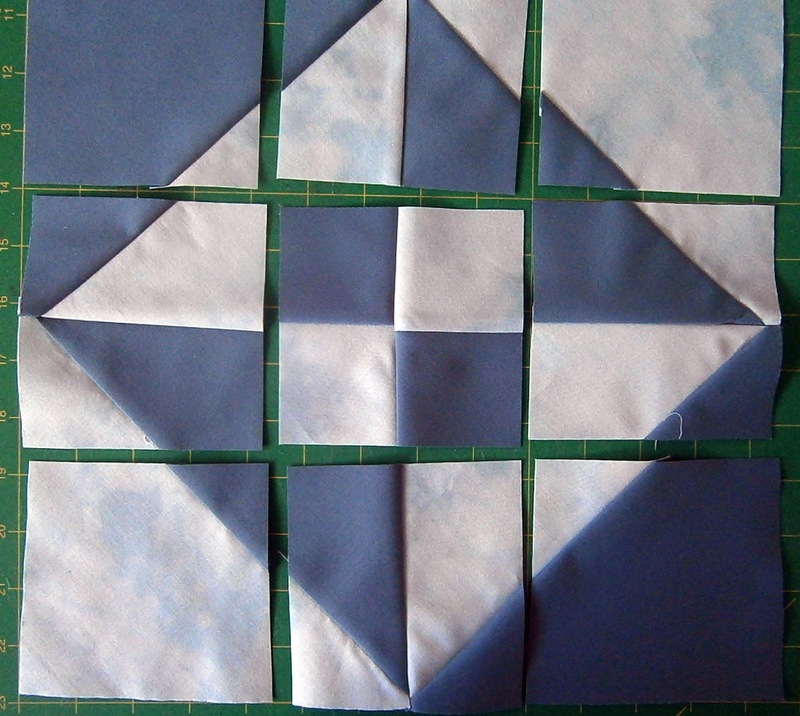 Next turn all four corners by 180 degrees, so that the little triangles are on the outside corners. The final stage on the re-arrangement is to turn the middle blocks from each edge 180 degrees, so that the 'arrows' are pointing in to the centre. 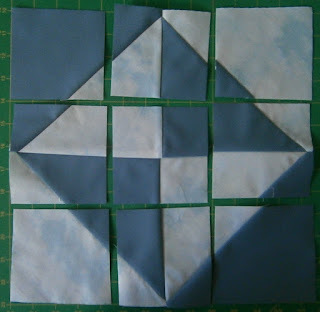 This is the only step that is in addition to what you would have done on the previous Disappearing Hour Glass tutorial. Now resew your 'nine patch' together, and you will get a block that looks like this, with a counter change star in the middle of it. 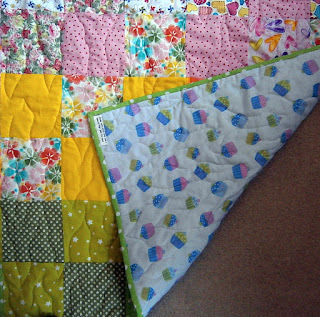 I can't show you a full quilt top yet (I've only managed to complete a couple of these blocks this week) but already I'm excited about how it is going to look! 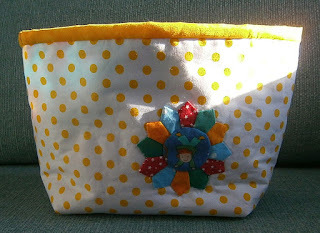 Other sewing was to make another fabric 'bucket' gift. 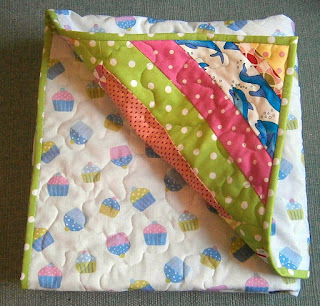 I love that they are completely reversible! 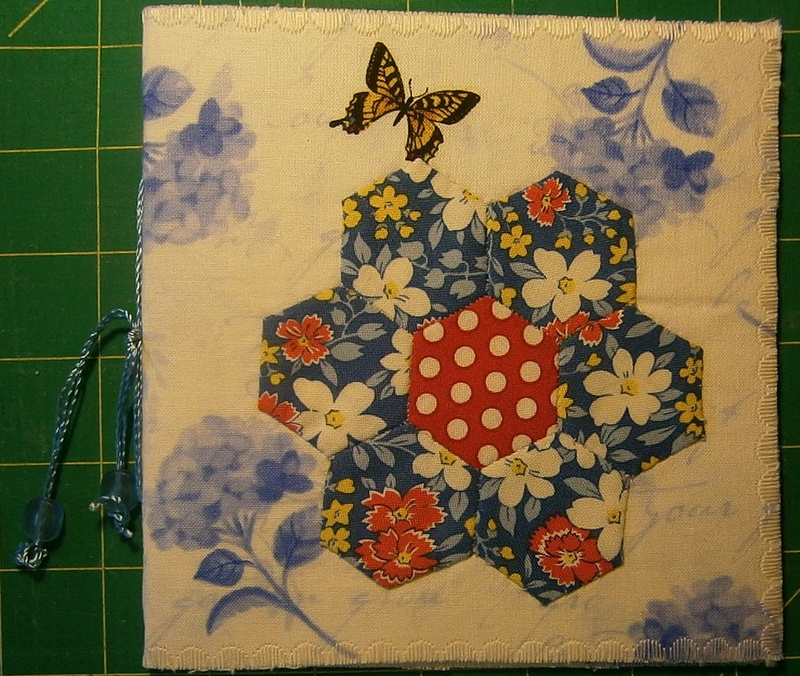 A chance to use the tiny Dresden that I made a couple of weeks ago. My last sewing was to make a set of postcards - the final set for a swap group that I've been part of for several years, but which is winding up. 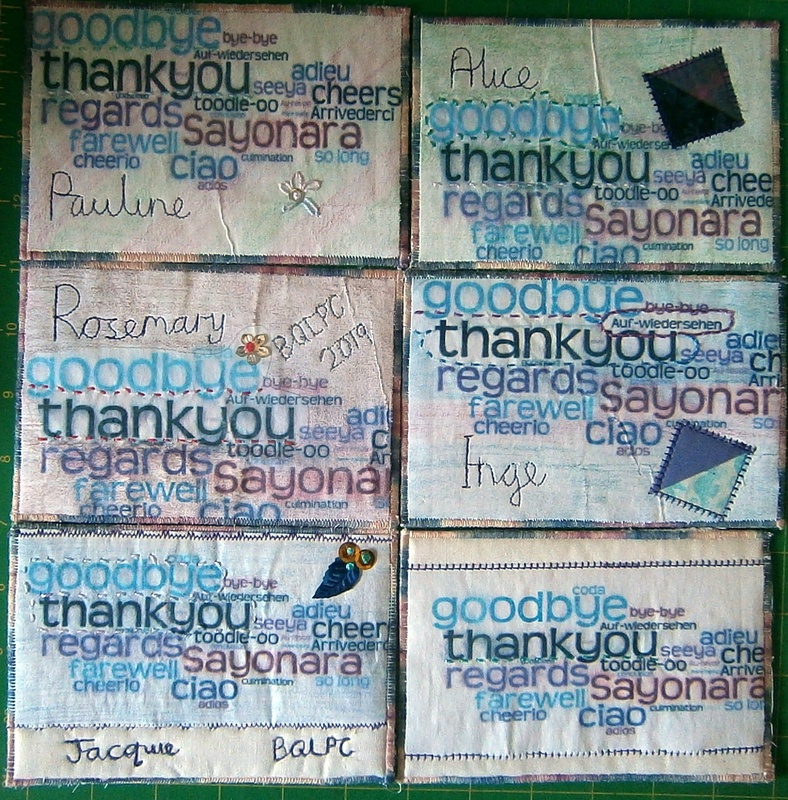 This was a final experiment for me - turning printed paper into 'fabric' and then sewing it. 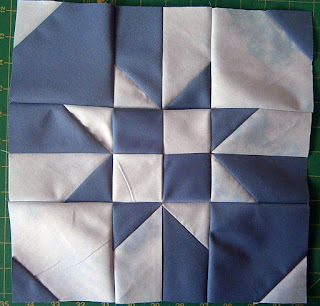 I did this by applying it to a fine muslin with dilute PVA. 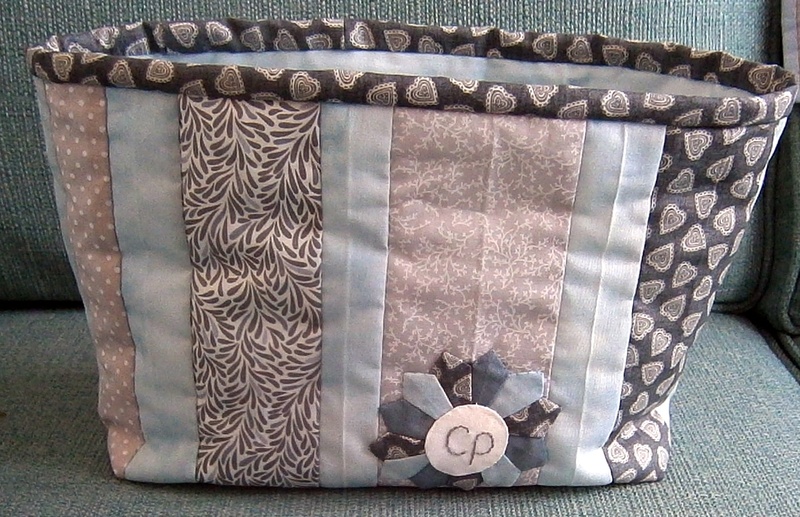 A number of tutorials online then recommend adding another layer of something on top, like coloured tissue paper, again with PVA. Nice idea, but I wanted to keep the print a little clearer, so I just coloured the fabric paper with Inktense pencils and added machine and hand sewing to complete them. 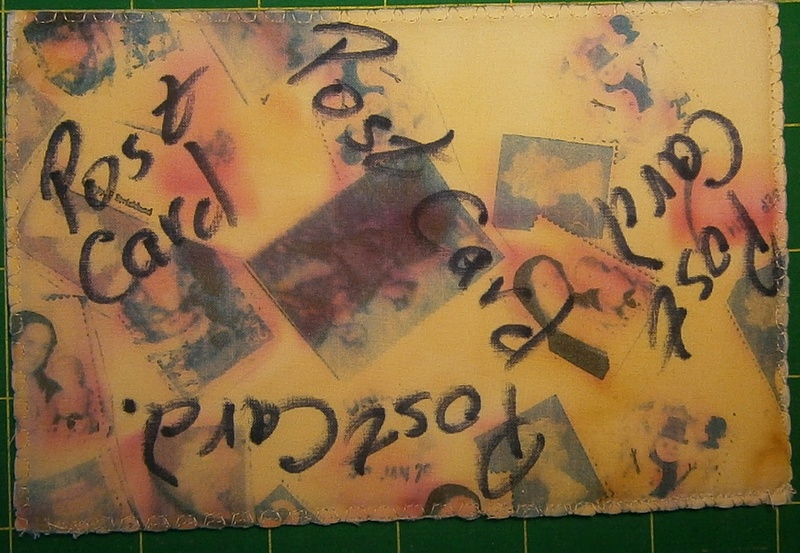 Something that I'll try again in the future, when I'm less concerned about retaining the printed text, perhaps. 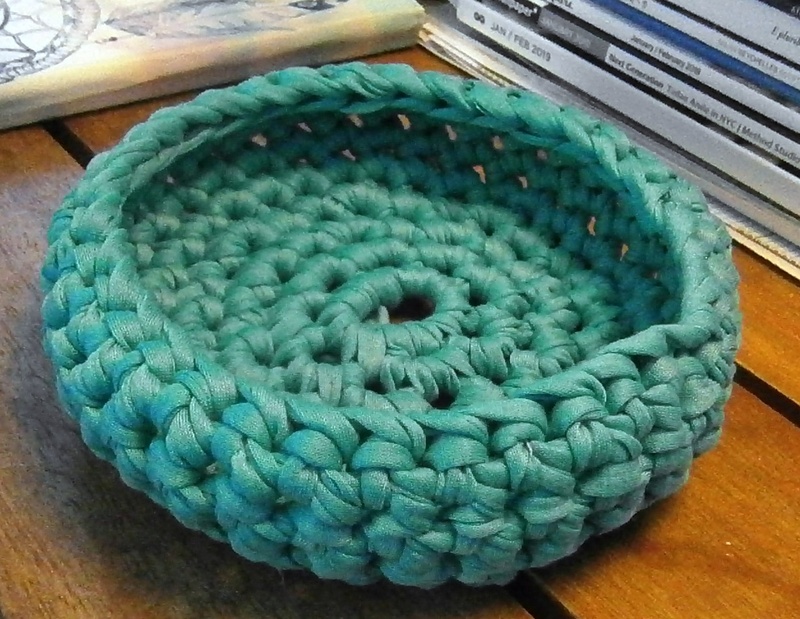 I also managed to make a crochet bowl (no wonder I'm tired, it's been a full on week!). Using a ball of t-shirt yarn from Tiger for only £3, I was quite pleased with this, although it might have been nice to have bought another ball of yarn and made it a little deeper. It's roughly 6" across and 1.5" deep. Off for a nap before enjoying some more half term fun with my lovely family!